Everything begins with a vision. It is followed by an “execution and capture,” a term used by photographers, videographers and moviemakers. We at the Shoot The Centerfold are no exception. This is why we have produced a camera shoulder support rig that not only is the sexiest rig ever built, but also the most versatile and durable camera support rig with the best balance, especially when compared to other solutions currently available. Our goal is to offer a tool that is so supportive and easy to use that anyone can shoot video without having extensive experience. Shakiness is eliminated by using a low-balance pivot point that is so solid you can even take your hands off when it’s balanced and neither the camera or rig will fall off your shoulder. We have used the best materials available to produce the ultimate all-in-one unbreakable system. The design and versatility allows you to mount most smaller or larger cameras and accessories, which fit perfectly to the industry standard-size screw and mount holes. The STC Shooter weighs in at only 3.5 pounds. Although it looks heavy, it’s actually made of high-grade aluminum to keep the weight lower than most rigs in same category. The counterweight is another 5 pounds and can be adjusted from front to back depending on accessories. (You can micro-adjust the balance to achieve perfect balance). 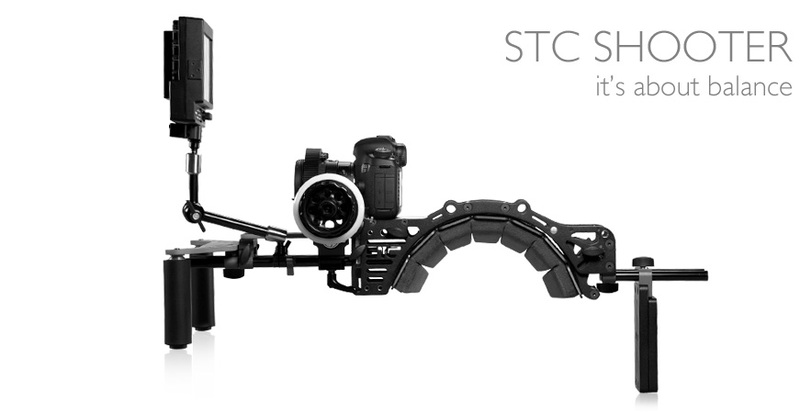 The STC Shooter is perfect for documentaries, weddings, location shooting and independent movies. It makes shooting handheld scenes a breeze. The durability allows you to use the rig in even the most challenging situations, even on the frontlines in a combat zone where performance, strength and rigidness speaks for itself. One of the most outstanding features on the STC shoulder rig is the fact that it is balanced to perfection, which allows anyone to become a videographer. We have eliminated all excessive weight from your hands thus freeing them to focus and zoom. The shoulder pad is very long and wide, and can be contoured to match the slope of the shoulder. As a bonus, it’s also adjustable for different shoulder thicknesses, removable to allow switching sides, or just to have better access under the rig. The cushion is made of a polyfoam specially formulated to give a soft, yet firm enough to provide comfort all day. 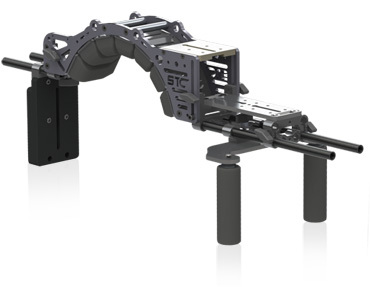 The front plate is adjustable in height and is also longer than on most other shoulder rigs. For storage, it folds neatly underneath the rig when the top screws are removed. Its weight and compact size make it perfect for documentaries, independent films and just about anything you can shoot. There are many ways to configure the handles; up or down, closer or further apart, but not adjustable in angle (since the only reason for adjustable handles is wrist fatigue). 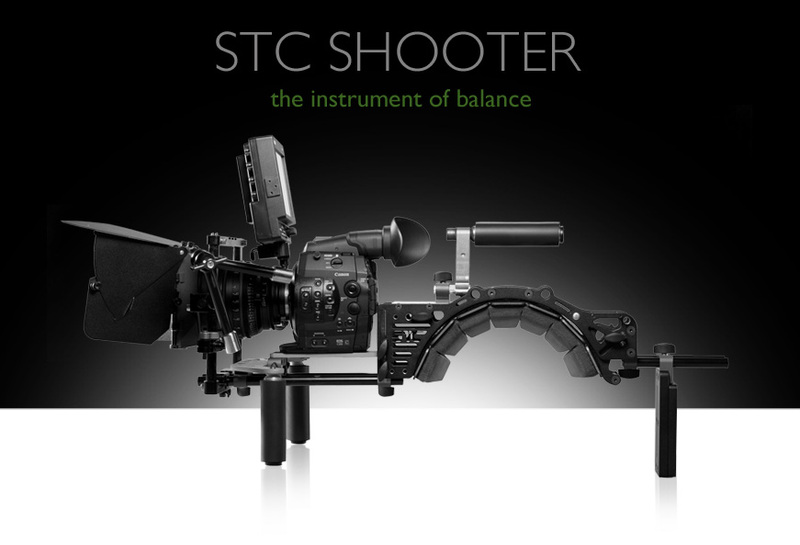 With the STC Shooter rig, it’s balanced so there is no weight on the hands, which means there’s no fatigue. All in all, it’s the most compact rig in its category right out of the box. Why would Shoot The Centerfold’s master photographers add video to their product line? First, still photography and videography work hand-in-hand. Second, it’s the future. Most of world’s greatest directors were also photographers and despite changes and advancements in photography and cinematography, the visual principles will always remain the same. Today, having video capabilities has become necessity, due to editors and clients requiring video in addition to still images. For working photographers, this is nothing new, but photographers trying to get their foot in the door may quickly find it challenging if they can’t deliver video in addition to still images. As clients have become more demanding, photographers need to be ready to deliver the best still and video projects possible. That hasn’t changed and never will. However, what is new is that Shoot The Centerfold has designed and developed a camera support that gives any photographer the ability to shoot video or films without extensive experience and achieve stable, smooth results. Shoot The Centerfold and Eric Auclair teamed up to design the revolutionary and perfectly balanced STC Shooter system that gives the photographer the ability to focus their attention on the subject instead of worrying about the stability of their gear. Due to the high resolution available from today’s cameras, publications and industry are now also pulling still frames from video footage for their covers and pictorials. STC, having always been devoted to staying on the cutting edge, wants to stay a step ahead and develop the best possible products for your enjoyment and your client’s satisfaction. Whatever may your future plans be; stills, video, short movie or just awesome behind-the-scenes footage, STC’s Shooter rig will give you the ability, stability and beautiful results with ease. *Camera and lens sold separately! Buy the first and the last rig you ever need.